Sir Syan was considered Drangleic’s most loyal knight. 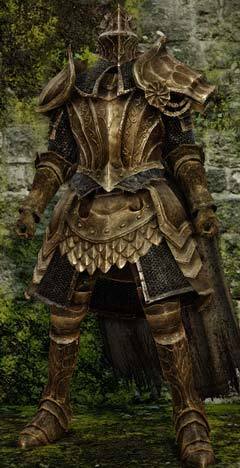 His rank amongst Drangleic’s knights is not given, but it is possible he was part of the Royal Guard that protected Vendrick, perhaps in a time prior to Velstadt, the Royal Aegis. His renowned loyalty may have been because he was with Vendrick since the beginning or from early on in his reign. He wielded a halberd that was meticulously crafted and distinguished, and wore armor that was solidly crafted towards high defense. When the Giants invaded Drangleic, Sir Syan volunteered to lead the advance party, a small group of soldiers who go ahead of the main body of troops to prepare the way for their arrival. When preparing the way, he was slaughtered most dishonourably, most likely by the Giants who do not live by the laws of chivalry. When Vendrick learned that Sir Syan had been killed, he commissioned replicas of his armor and accoutrements. He then bestowed them to promising knights. At the time of Sir Syan’s death, Vendrick had commissioned a greatshield specifically for him called the Greatshield of Glory. It was most likely commissioned as a reward for Sir Syan’s bravery in volunteering to lead the advance party. However, before the shield was completed, Sir Syan met his demise. Syan may have been wielding an alternative shield, likely the Tower Shield that the knights wearing the replicas of his armor are seen with. It is said that not long after these promising knights donned the replica armor of Syan, did they go thoroughly mad. Why the knights went thoroughly mad. Those promising knights who donned Sir Syan's replica armor are said to have gone thoroughly mad soon after, but why this happened is never explained. We know that Vendrick cared deeply for his loyal knight, and commissioned a greatshield specifically for him. It may be that when Vendrick learned of Sir Syan's dishonorable defeat he sought to resurrect his old friend. In a way, seeking to resurrect Syan does not deter him significantly from his goal of overcoming the curse. So it was that Vendrick commissioned these suits of armor, but also infused them with the soul of his dead friend. Somehow this soul endured with its memories of Sir Syan, as the souls of Gwyn, Seathe, the Witch of Izalith and Nito have also done, but on a grander scale. When the promising knights therefore donned Sir Syan's replica armor, their minds became infected with the will of Sir Syan, who, not being able to cope with its own demise, drove them thoroughly mad. Replica of the armor of the loyal knight Syan. This solidly-crafted gear offers high defense. Sir Syan was widely known as the Kingdom's most loyal knight, and when the Giants invaded, he volunteered to lead the advance party, but he was slaughtered most dishonorably. The King commissioned replicas of Syan's accoutrements and bestowed them on promising knights, but not long after they donned the armor did most go thoroughly mad. Greatshield of the King's loyal knight Syan. The King commissioned this greatshield specifically for his loyal knight, but Syan met his demise before it's completion.